Umm… is this thing on? | Mmm, Tasty! Sorry for the silence folks. I didn’t mean to disappear for an entire month like that. Just, it’s been a challenging month, food-wise. See, I’ve been battling some allergy-related issues for a while now, and have been put on a special diet. What kind of special diet, you ask? Oh, just a gluten-free-vegan-except-for-non-cows-milk diet! So that means no eggs, no cow’s milk dairy, and absolutely no gluten. Vegan I can do pretty easily, but the gluten-free part has been challenging. And I have a minimum of two months left eating like this. So I’ve spent the last month re-learning where I can safely eat in Toronto and what kind of things I can bake. Even the simple task of grocery shopping has been a challenge. You have no idea how much hidden gluten is in things until you’re not allowed to eat it anymore. Don’t those look yummy? The ‘butter’ is actually Earth Balance, and of course that’s a ton of good old Canadian maple syrup slathered on there. I modified the recipe slightly based on what ingredients I had in the house, and was really pleased with the results. I’ve since made them three times, and have added blueberries to the batter as well as making them plain. They’re good either way. In a large bowl, mix together the dry ingredients. Make a well in the centre, then add in the wet ingredients. Use a fork to combine all the ingredients well. Preheat a large, non-stick frying pan over medium-high heat, and let the batter rest for a few minutes. When the pan is hot, oil it (or use cooking spray) and scoop your batter with a ladle or ice cream scoop to form pancakes. Do as many as you can fit into the pan comfortably – my pan fits three at a time. Cook about 2 1/2 or 3 minutes, or until a few air bubbles have formed on the surface of the pancakes; don’t worry if it’s not as many bubbles as you’re used to with ‘regular’ pancakes. 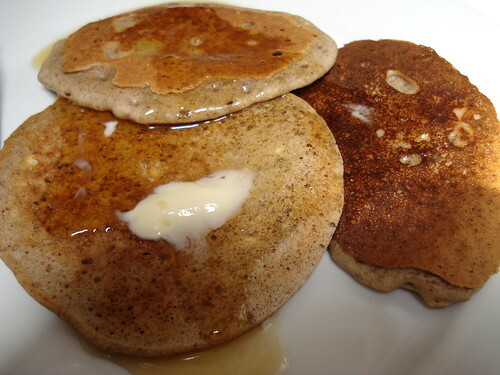 Flip pancakes and cook for another 2 minutes or so, until golden brown. Keep warm on a covered plate (or in your oven, like I do) until ready to serve. Serve with Earth Balance and lots of maple syrup. I actually have a ton more posts planned, some gluten-free, some not (stuff I’d planned to post about before this new diet took over my kitchen!). Stay tuned! Daring Cooks July: Nut Butter!